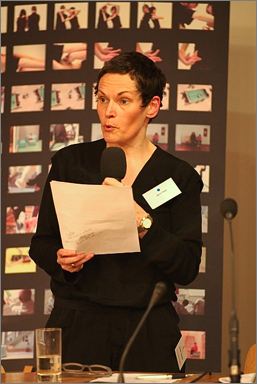 Janice Parker: I am a freelance choreographer and dance artist and I work in, and with, the community in socially engaged arts practice. This means that I work with a diversity of people in a diversity of contexts. The piece of work represented here – this one – is a series of seven site-specific films that are titled ‘Amplification and Restriction’. They are located in the National Museum of Scotland, Edinburgh. The performers are from Traveller Dance Company. In the project my role was to initiate the idea; co-ordinate and administrate the project; develop and guide the process both artistically and politically; and bring the work to a conclusive final performance. The work was funded through Artlink (that is Artlink, Edinburgh and The Lothian’s, Mid-Lothian Council and the National Museums of Scotland. The work had a number of artistic goals. The first was to create a performance based on each dancer’s responses to, and interests in, the museum environment and, in so doing, to reflect the individuality of each person. Equally the idea was to create performance that engaged and contributed to the life, character and culture of the museum. These were my two starting points. Alongside and layered into this were political and personal goals – to challenge the perspective held on individuals with learning disability, to create more and different visibility of individuals with learning disability and to work in a way that essentially fulfilled something personal for each performer from Traveller Dance. The process spanned a period of over two years from the beginning negotiations and discussions to the screening of the completed work. ‘Public’, for me, included everyone who directly or indirectly encountered or contributed to the process. As in the Oxford English Dictionary the definition of ‘public’ is “of, for, or known, to people in general”. I like this definition. I work collaboratively and, for me, people – the public – are inherent to collaborative arts practice. My ultimate aim is to make performance and I do this by working in partnership with other people. Each of the partners in this process has a different role and contribution to make to the whole. I think, generally, in our minds ‘public’ often means the receiver of art, but to me ‘public’ also means the contributor. In this project, for example, the museum is a public space and a public facility that offers a public service. I approached the museum with my idea that we, Traveller Dance, a company that focuses on the movement qualities of people with learning disability, meet in the museum on a weekly basis with the eventual aim of creating a performance in response to the experience of being there regularly. The museum liked the idea and invited us in. At this point they perceived us, and we were members of the public and, as such, receivers of what the museum had to offer. However by the end of our time there, the museum was challenged to consider itself a receiver of new perspectives – and that was the perspective of people with learning disabilities and their art. This brought up a number of questions. For example, what exactly does ‘being accessible’ mean? And on whose terms is it constructed? What is the place and potential of people with learning disabilities in a museum? Existing preconceptions and expectations were challenged and debated. Just exactly who is the giver and who is the receiver? And on what experience and knowledge base was the museum basing its understanding of the involvement of people with learning disability within its environment, culture and service provision. And there were also questions about the place, the position, and the value of performance art within a museum environment. For me, the tables were turned. The seven films that comprised ‘Amplification and Restriction’ are just that: a distillation of seven particular and, I believe, valuable perspectives on the Museum. They have the potential to contribute to the life of the Museum, to its culture, to its character and to its purpose. They work by just being there within that environment and also by being discussed and debated pro-actively at other times within other contexts. The role of who was public was essentially reversed. And within that, of course, is the fact that both, the museum service and staff and the participants from traveller dance were publics of sorts within the same process. The main ingredient of that process is exchange. As a performance artist, my starting point is people as performers. Often people who have had no previous performance experience. At this point, they are the public. Each contributes their distinctive aesthetic as we work together to create a finished performance. Then, at this point, the public become the general audience who witness and receive the work. In the case of the museum, this public were the general public as they watched us create and devise our work out in the public arena of the museum: they sometimes stumbled upon us; they sometimes participated and joined in. Sometimes they completely scurried away; other times they were furious that we were there at all; at times they were really moved; sometimes they did not notice at all; and sometimes they asked questions or they were just silent witnesses. So, for me, ‘public’ and ‘art-making’ is all of this and, at its best, it is an active, dynamic, ever-changing and fluctuating exchange.